Favorite Sport (and why): "Basketball because I have played it all my life. All of my coaches and teammates have really shaped me into the person and player I am today. I have been blessed to be apart of successful teams. I have had coaches in the summer and during high school season that care a lot about me and push me to be better." Best Part of High School Sports (and why): "I appreciate that I am given the opportunity to represent our community through sports and I am very competitive and love to compete in games. My teammates!" Best Advice from a High School Coach: "Every Wednesday we are inspired through our leadership sessions by all of our coaches. Coach Schwenn has said many things to me throughout high school but definitely just being able to still believe in me no matter the situation and wanting me to become a better player and person each day." Most Memorable Moment in High School Sports: "Beating Waunakee my senior year at home by a buzzer-beater and then at their place by 10." Best Part of Playing Three Sports: "Meeting new people and coaches, learning time management and many other skills such as organization and communication. Also being able to experience moments with your teammates and coaches positive and negative. Being able to represent my community through sports." Toughest Part of Playing Three Sports: "Getting enough sleep and having energy to do homework." Favorite Opponent (and why): "Waunakee because we have been rivals for years and the environment when we play each other is like a sectional game no matter where it is hosted. Being on the court with my cousin Maddie Farnsworth for four years always makes the games more fun. I prefer to play with her than against her though." Toughest Individual You’ve Competed Against (and why): "McKenna Warnock because she is very good on both ends of the floor and when most teams play Monona Grove, she is the one we have to stop." 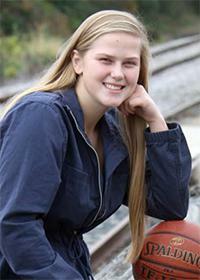 Most Admired High School Teammate (and why): "Jaylee Grundahl my sister, I played with her for two years. I learned how to play defense from her. McKenna Minick she is a true leader and helped my transition to playing varsity as a freshman, she now in on the coaching staff in DeForest." College Plans: "Go to UW-Whitewater to study Early Childhood education and continue playing basketball." Activities Outside of Sports: "Spending time with family and friends, boating and spending time on the water or in my aunt’s pool." I Find it Relaxing to: "Listen to music and take a nap."